Developing Story: Kyle Haines - College Hockey, Inc. Offensive skills blossoming for Lake Superior's two-way defenseman. 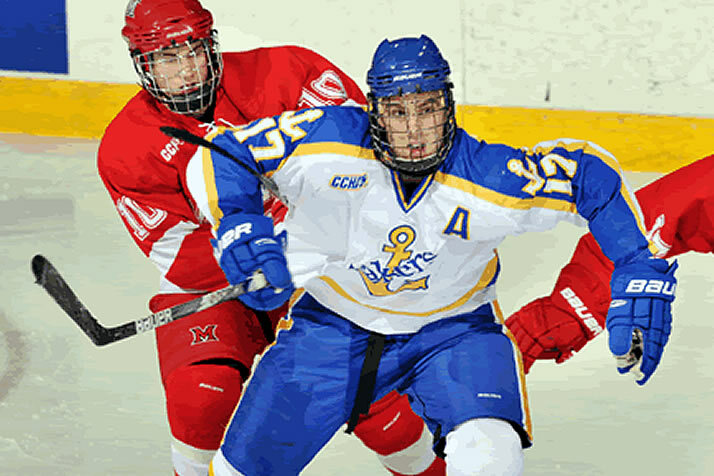 Kyle Haines came to LSSU from the Weyburn Red Wings of the SJHL. In Developing Story, a regular feature on collegehockeyinc.com, we highlight current college hockey players who have developed their skills during their careers – either on the ice or in the weight room – and in turn made a bigger impact on their team’s success. Kyle Haines has seen a spike in offensive production as a senior, one that’s due in part to increased opportunity. As a regular contributor since he arrived on campus, however, it’s clear there’s more to it. Haines’ point totals have jumped from 4 as a freshman, 5 as a sophomore and 10 last year up to 17 this season, indicative of his increased skill and confidence as well as his playing time. Haines recognizes that, and says that the time the Lakers devote to development in practice has made a big difference. “We have a pretty good block of time in practice, about 30 minutes or so, that is dedicated to working on skills,” he said. When you practice four times a week, that adds up quickly. Haines’s effort paid off Friday night, when he scored the game’s only goal to give Lake Superior State a 1-0 win against Ohio State. He gobbles up minutes and, for the first time in his career, leads the team’s defensemen in scoring. He and Boston Bruins draft pick Zach Trotman give Roque two outstanding all-around defensemen to lean on. The Lakers have put together a 14-11-5 record and are within two points of the CCHA lead. Haines, meanwhile, is tied for fifth among defensemen in conference scoring and boasting a well-rounded, two-way game. It bodes well for an LSSU team looking to reach Joe Louis Arena in the CCHA Tournament for the first time since 2007.